As always, I learn a lot just by publishing these photographs. 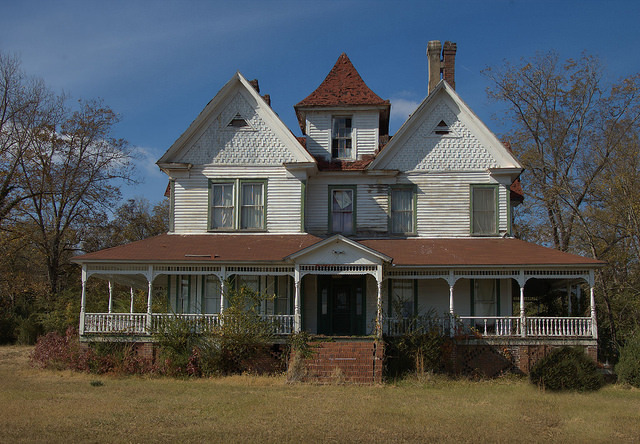 Through some source, I had seen this house identified as the Reynolds-McGown House, but Glenda R. Elliott wrote to say this was actually home for many years to her grandparents, Claude & Ruby Hill. Beginning in the 30s, if not the late 20s, my maternal grandparents, Claude and Ruby Hill lived there. The wedding reception of my parents, Jenny Ruth Hill and Edward Elliott, was held there on June 20, 1939. I was born at home there the following June. My mother and I lived there while my father served in World War II. When my father returned from the service, we continued to live there with my grandparents until 1957 when our family sold the house and moved to Thomson. By then my younger sister had been born in ’52, and my grandfather had died in ’55. The house was considerably remodeled during the time my family lived there. As I recall the house was bought by the Foster Jackson family. I (also) clearly recall my grandparents and mother referring to it many times as the “Birdsong House”. I believe this meant it had been built by and/or originally owned by and first lived in by the Birdsong family. Glenda also notes that she’s heard the house dates to 1917-19, but she is still researching it. And Glenda’s sister, Edlyn Hill Elliott writes: Claude and Ruby Hill bought this house in the 30’s I believe. It was called the Birdsong house. Claude Hill was a USPS carrier and Ruby ran a merchantile store. My mother, Jennye R. Hill was living there & teaching school in Sparta when she married my father Edward C. Elliott. My sister, Glenda was actually born in the house. I was born in Bunion Clinic in Milledgeville, but we still recided in Mayfield, where the house is located. We all lived in the house as an extended family and attended Horeb Baptist Church. In 1957 we moved to Thomson. During the 60-70’s McGown ran Hancock co. The Fed Gov’t gave him ten million dollars & Ford Motor Co. donated 8 million to his group to see if they could manage a business. He built 5 fish ponds near Mayfield. My distant cousin in Royston had a fish house with 17 waitress & was fishing in Fla. for catfish & buying fish from Purenia for $.85 a pound. He heard about McGowns fish & came to buy fish from him. It took him several trips before McGowns men would let him see McGown. McGown asked him how many fish he wanted. He told him 5 ton now and several more tons every month. McGown told him they were expensive, he would have to charge him $.65 a lb., of course he agreed to take them. The ponds never produced any fish. My cousin never got the first fish from him. McGown wanted to fly a plane and died flying his plane. While in Royston you should have checked out the Catfish House. They would host Ford Motor Co’s fishfries & other large business. This info about the money from the U. S. Govt. & Ford motor co and the fish ponds was in the news every week during those yrs. Claude and Ruby Hill bought this house in the 30’s I believe. It was called the Birdsong house. Claude Hill was a USPS carrier and Ruby ran a merchantile store. My mother, Jennye R. Hill was living there & teaching school in Sparta when she married my father Edward C. Elliott. My sister, Glenda was actually born in the house. I was born in Bunion Clinic in Milledgeville, but we still recided in Mayfield, where the house is located. We all lived in the house as an extended family and attended Horeb Baptist Church. In 1957 we moved to Thomson. I’m going to correct the name of the house soon. Going through a bunch of comments at the moment, but I appreciate the history! History is a constant learning experience for me and that’s what makes it fun. Thanks again! I also knew the house as the Birdsong House. My GG grandfather was Edwin Franklin Birdsong, a planter of some renown in Hancock County before the Civil War. The Birdsong family was among the early residents of Hancock County and there are LOTS of them in the records. I’m 98% certain this was not Edwin’s house but likely that of one of his brothers or sons. 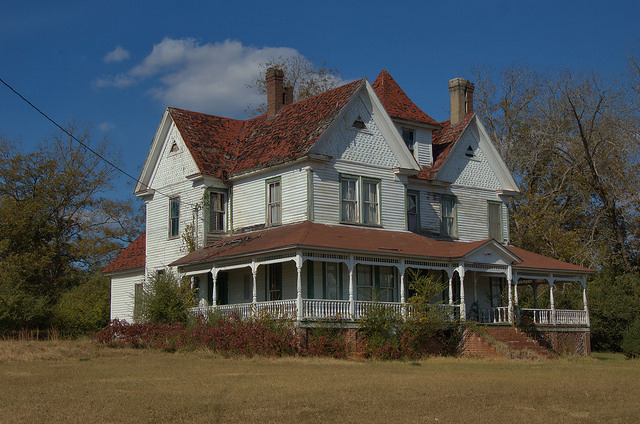 Sometime shortly after the Civil War Edwin built a house on the Warren County side of the Ogeechee near Mayfield and he lived there until his death in 1902. The Hills and/or the Elliotts would likely have known my grandfather (Leon Cox) and my father (Frank Cox). We lived in Atlanta and they were “weekend farmers” of part of the property on which Edwin built his house in Warren County. We had extended family in Mayfield who we visited often. I’d love to know which of the Birdsongs built this house! I got in touch with the folks associated with the catfish farm (at the time) since they owned the house. I told them of my family history and my interest in seeing it, and they wouldn’t let me do so. The rushing family also lived there and run the store next to the birdsong house thomas rushing , irene rushing, derrell rushing, tommy rushing, arlene rushing. They sold the house to john mcgown in the late 60’s and moved to thomson the book black boss has my grsndaddys name in it thomas rushing cooking hogs and catfish for a gathern in mayfield one day. The house after that was purchased by thomas Benjamin rushing his wife was irene rushing they had three children arleen rushing tommy rushing and derrell rushing which is my father . thomas sold the house to john mcgown and they moved to thomson also. He cooked bbq on the weekends in the store next door which they owned and ran. Thomas worked at ft. Gordon so it was a long drive during the week to work his day job. Many more stories to tell just cant type it all here….